Purchasing a used vehicle can quickly become an overwhelming prospect. You want to guarantee you are getting the vehicle that perfectly fits your needs and price point, but with so many possible choices out in the world, it can be a nearly-impossible decision to make. Luckily, Certified Autoplex in Carrollton, just outside of Dallas, TX, is here to help by providing you with detailed walkthroughs of various vehicles in our inventory. Here, we will be covering the Jeep Grand Cherokee. The Jeep Grand Cherokee has always had a reputation for being the adventurer's SUV. With its incredible power, handling and off-road capabilities, it is certainly easy to see why. However, in recent years, it has also had the additional comfort, luxury, convenience and safety features that make it a great SUV for any kind of driver. 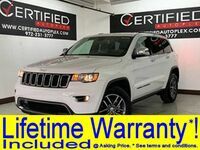 Continue reading below to see available models and features for the Jeep Grand Cherokee, and if you are already interested in a used Jeep Grand Cherokee in Carrollton, TX or Dallas, TX, you can follow the link below to our inventory. We currently have 6 models of the Jeep Grand Cherokee, 3 of which are from 2017, 1 of which is from 2016, and 2 of which are from 2014. 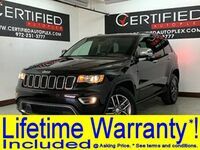 As you may expect, one of the most distinctive features of the Jeep Grand Cherokee continues to be its performance. The 3.6L V6 engine in the Jeep Grand Cherokee can generate up to 293 horsepower and 260 lb-ft of torque, making it one of the most powerful SUVs available on the market. Because of this power, it can tow up to 3,500 pounds, which is really impressive for a vehicle this size. With this power comes an equal amount of handling to keep it in check. 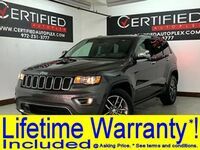 Along with the 8-speed automatic transmission, the Jeep Grand Cherokee has an electronic stability system, braking assist and speed-sensitive steering to give you an incredibly smooth ride. The Jeep Grand Cherokee also has numerous great interior features designed for the utmost comfort and convenience. First, it has an impressive 68.3 cubic feet of cargo storage, which is going to be more than enough for most situations. Additionally, the Jeep Grand Cherokee has a voice-commanded touchscreen navigation system, a 19-speaker premium audio system, keyless entry and much more.